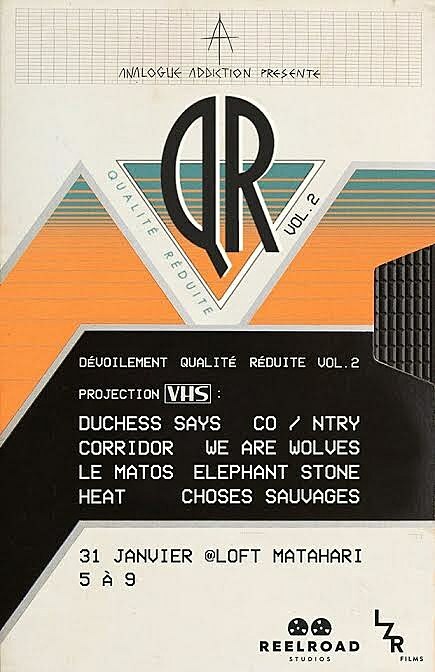 Montreal artists Elephant Stone, Duchess Says, Heat, We Are Wolves, Corridor, Le Matos, Choses Sauvages, and CO/NTRY all feature in the second volume of video series Qualité Réduite. The series celebrates the VHS format in all its lossy glory, not to mention documenting the current Montreal scene, shooting the bands live at Latraque studios. This is no modern filter: actual VHS cameras were used with old-school video effects. The videos were screened on Tuesday night (1/31) at Montreal’s Matahari Loft, with 100 physical VHS copies now for sale and will be officially released on February 8. You can watch the whole thing right now — all eight videos can be screened below.